DESCRIPTION: White hall Decorative Copper Rooster Weathervane - Polished. 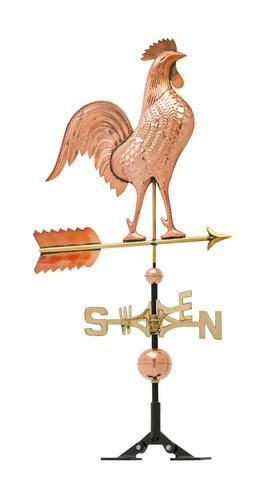 A classic Copper Rooster Weathervane, full bodied size makes a distinctive statement mounted to your rooftop, garage or cupola Fully functional. Arrow points into the direction of the wind to help determine pending weather. Included adjustable base allows for a variety of mounting options. Made of stamped copper; Color will patina naturally over time Made of stamped copper; Color will patina naturally over time Makes a great first impression, enhancing the curb appeal and value of your home. Assembly Instructions: Yes.Included adjustable base allows for a variety of mounting options. Made of stamped copper.Color will patina naturally over time Made of stamped copper.Product Dimensions: 20""L X 3""W X 46""H, Color: Polished. Material: Copper. Arrow points into the direction of the wind to help determine pending weather.Country of Origin: Indonesia. Warranty: 1-Year. Shipping, Handling & Insurance: A fixed fee of 30.00 USD will be charged for shipping this item.